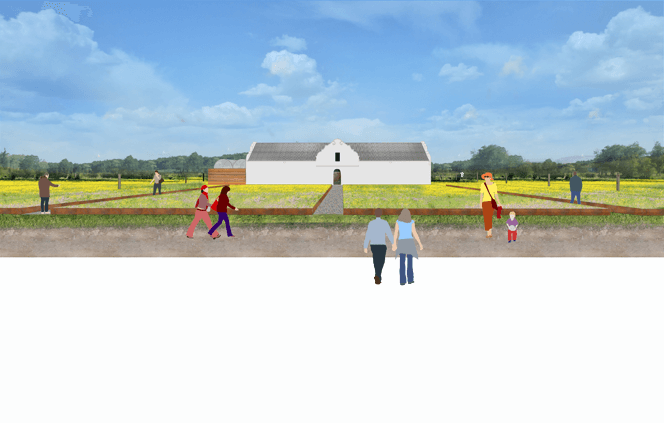 We were approached by Usana Farming Estate to develop a new masterplan for the historical farm Klein Welmoed which would streamline the various activities that are hosted here. So we introduced the concept of a sequence of gardens, each with a unique identity, that lead the visitor through to the reception space where events are hosted. We were also tasked with conceptualising a new function venue attached to the historic barn. The charm of this old building is its beautiful simple geometry and its position, seemingly alone in the landscape. We tried to retain this by only introducing a raised meadow, that creates pathways leading to the front door and reception spaces behind the building. Instead of keeping the old asbestos lean-to roof behind the existing store, we proposed to revise the structure in a modern way which would allow us to solve a few practical problems.